If you have any aches, pains, or discomfort, the holidays are the perfect time to try and do something about it. With less work to do, and more time on your hands, it’s the perfect opportunity to give your body the tune up it separately needs to heal. Not sure where to start healing yourself of your aches and pains? No problem! I’ve produced a useful series of articles and videos that can fix your body from top to bottom! And best of all? You don’t even need to go to the gym or the doctor – you can fix yourself at home. Do you have lower back pain? If so, you are not alone. A very large percentage of the adult population suffers from some sort of back pain. In many cases, this is because we spend too much time sat down. One great way to fix this problem is with stretching. The key to getting good results from stretching is doing it little and often, and that’s why I created this five-minute stretching routine for back pain relief. Core is the term used by exercise professionals to describe the muscles of your midsection. A weak core will increase your risk of lower back pain as the main job of these muscles is supporting your spine. Stronger core muscles mean less lower back pain. You don’t need to go to the gym to strengthen your core muscles. In fact, you can do it in the comfort of your own home. Here is a five-minute routine for strengthening your core for less back pain. Like back pain, shoulder pain is very common. Ironically, if you exercise, you are more likely to suffer shoulder pain than someone who is inactive. However, even sedentary people can have shoulder pain – and again, that’s because of sitting too much. If you have shoulder pain, try this short but effective stretching routine for relieving shoulder pain. Frozen shoulder is a more serious type of shoulder pain. With frozen shoulder, also known as adhesive capsulitis, the shoulder joint stiffens up making normal movement all-but impossible. Fixing frozen shoulder can take time and determination, but this 5-minute home routine for frozen shoulder will definitely help. Sleeping in an odd position, turning your head too fast, a car accident, or sitting in a cold draught can all lead to neck stiffness and pain. Your neck is a fragile joint, and any problems with it can make life miserable. 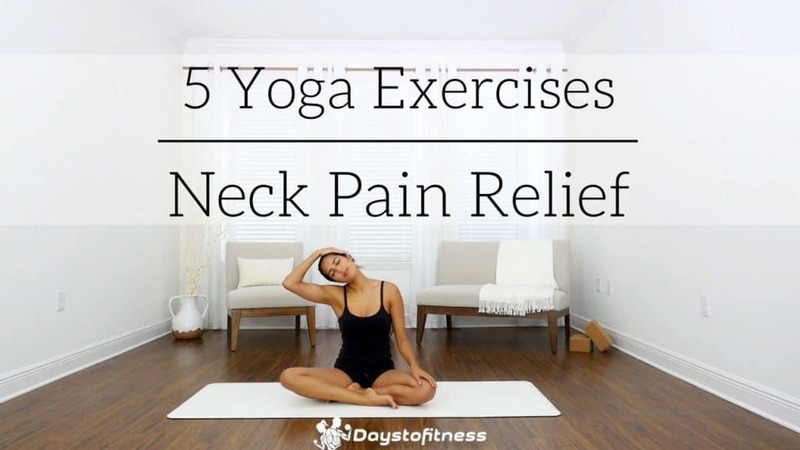 If you have a stiff, painful neck, fix it with this five-minute yoga exercise program for relieving neck pain. Your sciatic nerve runs from your lower back, down through your hips and buttocks, and ends right down in your feet. Too much sitting, as well as poor posture, puts pressure on the sciatic nerve which causes pain. That pain can occur anywhere along the length of the sciatic nerve, but is most commonly felt in the lower back and upper leg. Sciatica, the pain caused by sciatic nerve pressure, is very unpleasant, but it can be fixed. Here are five stretching exercises that will help relieve the pain of sciatica. When most people talk about back pain, they are usually talking about their lower back, also known as the lumbar spine. But your spine is a long structure, and also includes the upper back or thoracic spine. Poor posture and too much sitting can cause upper back pain. Luckily, fixing upper back pain doesn’t have to be complicated or time-consuming. Set your office chair and workstation properly, and also do these five exercises for relieving upper back pain.